A strength indicator based on Elder's book. Its strategy is simple: when the slow curve grows and is greater than zero (red), and the fast one falls and makes a reverse (blue), we buy at the reversal point. When the fast curve moves up and turns down, close the deal. Conversely open a short trade if the slow strength indicator is less than zero and continues to fall. The indicator works on any timeframes, but performs best on H1 and daily charts. It has been observed to be able to predict the price behavior for three or four days. Not all instruments are equally good. It shows best results on the pound and the euro. 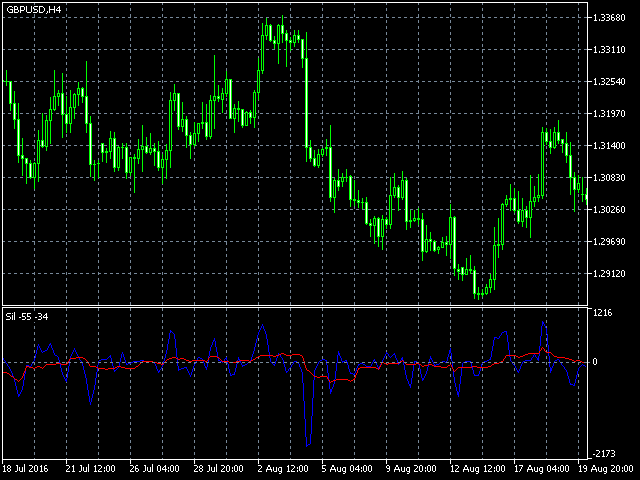 It is analogous to the same indicator for MT4.